Port Elizabeth, the largest city in the Eastern Cape and one of the country’s major seaports, has a rich cultural heritage. Also known as the “Friendly City”, Port Elizabeth was established when the British Settlers landed in 1820, and was declared a city on 28 July 1913. 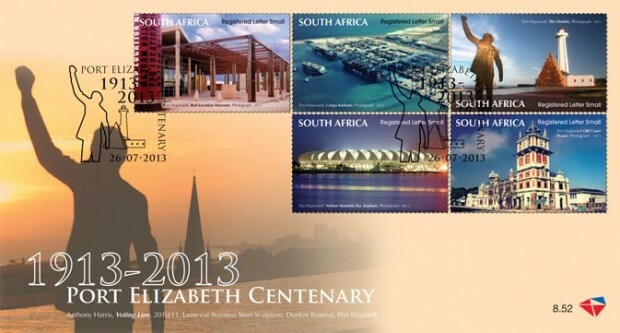 To celebrate the centenary of its city status, the South African Post Office will issue a set of ten stamps and two first-day covers on 26 July 2013. 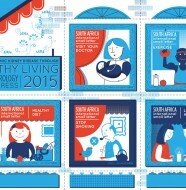 Port Elizabeth, originally named Algoa Bay, is South Africa’s fifth largest city. Situated on 16 km of coastline, it now forms part of the Nelson Mandela Metropolitan Municipality, which includes Uitenhage and Despatch. The Portuguese explorer, Bartholomew Dias reached Algoa Bay in 1488, where he planted a wooden cross on a small island now called St Croix or Santa Cruz Island. He gave the bay a name meaning “Bay of the Rock”, which was changed in Portugal to Bahia de Lagoa or Bay of the Lagoon, and which eventually became Algoa Bay. This colour lithograph by George Dinsdale depicts a view of Algoa Bay from Lady Donkin’s pyramid in Donkin’s Reserve. It is probably one of four prints published by C Hullmandel Publishers purchased for the city’s public library in 1926 from Cape Town. 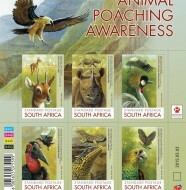 The final prints, including the one featured on the stamp, have many inaccuracies because they were copied from Sir Donkin’s sketches and then printed without Dinsdale ever seeing Port Elizabeth. 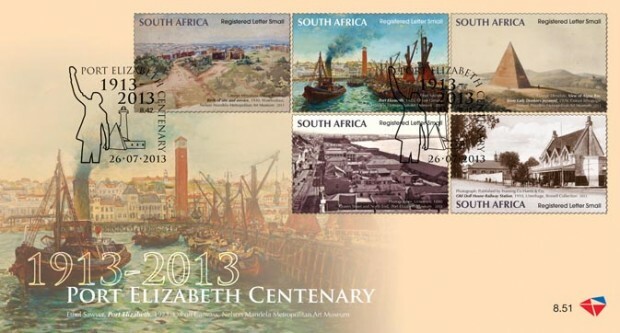 Featuring a painting by Ethel Sawyer, this stamp depicts the famous tug “Sir Frederick” in Port Elizabeth harbour. Ethel was married to the Harbour Master, who arranged for the “Sir Frederick” to be posed in the dock specifically for this painting. A detailed view of the city from South End to the Donkin Reserve is seen in the background. The “Sir Frederick” had a 35-year career and was involved in notable incidents such as the mystery of the Phantom Ship and the disappearance of the Waratah. Her career ended when she was scuttled near Thunderbolt Rock in Algoa Bay. This water-colour painting by George Pemba called Birth of Site and Service, depicts one of Port Elizabeth’s first black townships called Site and Service established in 1930. Pemba, who was born in 1912 in Hill’s Kraal, Port Elizabeth, was known as the people’s painter. His work reflects the richness and diversity of South African life, capturing the essence of the country’s people in paintings of rural and township life. 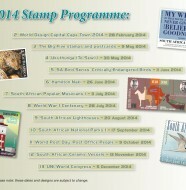 In April 2012, the South African Post Office issued a set of ten stamps featuring Pemba’s best-known works. This image of the old railway station in Uitenhage, fondly known by locals as the “Doll’s House”, appeared on a postcard dating back about a century ago and published by Hallis & Co, Port Elizabeth. The building remained in use until 1951 when it was vacated for the new station in Bubbs Avenue. It is now the Railway Museum which houses exhibits reflecting the town’s rail transport history including vintage steam engines and period furniture. The building was restored to its former glory in the 1970s and was proclaimed a national monument in August 1976. The stamp features an early photograph of the industrial area of North End, developed as a mixed land-use suburb immediately north of the Port Elizabeth city centre. It seems probable that the settlement was initially centred around a trading store located opposite the North End jail and run by Anne Rich from 1861. Today, North End is home to the impressive Nelson Mandela Bay Stadium overlooking the North End Lake. The figure of Nelson Mandela is the focal point of the Voting Line sculpture at the Donkin Reserve. It is actually the logo for the Nelson Mandela Foundation’s Madiba Trust, who gave permission to the Voting Line artist, Anthony Harris and assistant artist Konrad Geel, to incorporate it into their work. The metal figures represent all the communities who make up the Rainbow Nation and who voted in South Africa’s first fully democratic elections on 27 April 1994. The 11 000 ha Coega IDZ, situated within the Nelson Mandela Metro, is the largest in South Africa. It is strategically positioned next to Ngqura, the new dedicated deep-water port with purpose-built container, bulk and break-bulk terminals. The Coega Development Corporation develops and operates the IDZ and is responsible for the land-side infrastructure, while the Transnet National Ports Authority is responsible for the Port of Ngqura. Red Location, one of the oldest black townships of Port Elizabeth, derives its name from a series of corrugated iron barrack buildings, which are rusted a deep red colour. 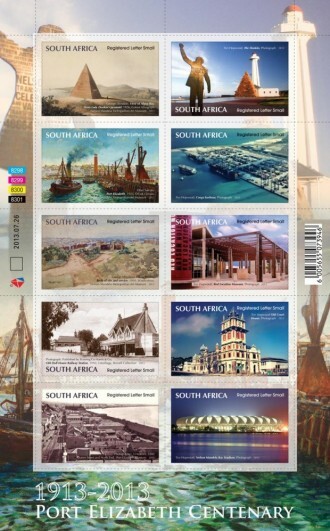 The stamp features a photograph of the Red Location Museum, one of two anti-apartheid museums in South Africa, built as a tribute to the liberation struggle. It also draws together the strands of the struggle that commemorate the efforts by different groups to free themselves. Uitenhage, also known as the Garden Town, was founded in 1804 and was originally the headquarters of the Eastern Cape. Victorian and Settler architecture add to the town’s unique character. A number of beautiful historical buildings have remained in excellent condition, including among others the old Court House, a prime example of Victorian architecture built between 1813 and 1815. R2 billion Nelson Mandela Bay stadium situated on the shores of the North End Lake. One of three coastal stadiums built in anticipation of the 2010 FIFA World Cup, the stadium regularly hosts major rugby and soccer matches and is also used as a concert venue. Its striking roof-structure made up of a series of white ‘petals’, gives it the appear-ance of a flower and led to its nickname, “The Sunflower”.